Sometimes, you just want to get out there and let your feet hit the pavement. And when you have a child, this can sometimes be difficult to find the time. That is why there are jogging strollers. With jogging strollers, you can place your child in a secure stroller that is made for jogging and you can still get your exercise in. Many of these jogging strollers come with features that you would expect on full-size strollers. These strollers can range from the conservatively priced to the outrageous. You just need to think of the features and price range that you are comfortable with and look for options in that range. We are going to be looking at some of the top models on the market today. When it comes to jogging strollers, there are basically only two types of strollers. One is the type with a front wheel that swivels as it rolls but may be locked when you want to go straight when running and the other type is a fixed wheel for running. Most models of jogging strollers have front wheels that swivel but can be locked. This gives you the option to let it swivel freely for ease of steering or you may lock it into place so that you can run. If you will be using the stroller for more than just running than this is the type of wheel that you want on your stroller. It is easier to turn and maneuver. Serious runners like a fixed wheel on their jogging strollers. This is because it is more stable at a higher speed and it handles road debris better. The main downside to a fixed wheel is that you cannot make sharp turns with a fixed wheel. You must lift the front wheel up in order to make turns. However, the stability that a fixed wheel offers when you are running may overshadow this inconvenience. If you are looking to use your jogger mostly for running and jogging, then the fixed wheel may be what you are looking for. Joggers are made to be more stable than a regular stroller so some of the features that you look for in a stroller may vary. Although the comfort features may be the same. Let’s look at some of the features that you may want to look for in a jogging stroller. Locking Front Wheel – Whether the front wheel is fixed or it is a swivel wheel that can be locked, you want a front wheel that can be locked into place for running. Safety Tether – You never want your jogger to get away from you. A tether is simply a cord that wraps around your wrist and is attached to your stroller in the slight chance you lose your touch of the stroller. Brakes – You need a brake to make sure that you can stop when you need to. When jogging, it is a nice feature to have a hand brake instead of a foot brake. Safety Harness – Just like other strollers and car seats, it is always best to have a five-point safety harness in a jogging stroller to secure your child. Canopy – Keep your child out of the elements such as the wind, sun, and rain with a large canopy. Look for canopies that have a peeking window so you can look in on your child while you are in motion. Reclining Seat – You want your child to be as comfortable as possible while in the jogger and you want them to want to be in the seat. Also, the motion may put them to sleep so a reclining seat will come in handy to make sure that they are in a good position. Tires – Make sure that your wheels can go over the terrain that you run over. Handlebar – For people of all heights, look for a jogger with an adjustable handlebar. Not only will it help you find the right height for you and make your run more comfortable, but it will make it easier to share between people of different heights. Folding – You want a jogger that is easy and compact to fold. If it is too hard to fold and unfold, you will be less likely to get it out and use it. Holders – On runs, things like drink holders for you and your child come in handy. Storage Area – This comes in handy when you are away on a run and your child needs a diaper change. If you don’t have space for a diaper bag, you may be in trouble. There are several things that you should take into consideration when you are considering purchasing a jogging stroller. Let’s go over some of them. Some of the best joggers have wheels that are larger. You want to have a front wheel that is at least twelve inches in diameter but you want your back wheels as large as fifteen to eighteen inches. The larger wheels give the jogging stroller more agility and stability over terrains like bumps, curbs, and rocks. They also tend to handle things such as dirt, loose gravel, and such, better. Smaller wheels are good for traditional strollers. However, you do not want to try running with a traditional stroller. The wheels on a traditional stroller would wobble and the front end would not be stable. This would also cause you to stop if you hit small bumps. So watch the tire and wheel size on jogging strollers. The best joggers will have handlebars that are adjustable to different heights and for different running positions. This makes it easier to find the best position for your height as well as find the best height adjustment if you are sharing the jogger with someone else. An adjustable handlebar is more ergonomic for running and helps reduce the risk of injury and discomfort to the runner. Some joggers are even angled so you can place your wrists and hands at a more natural position. This comes in really handy in long runs. Look for jogging strollers with wheel suspension because they will help with absorbing the motion from road bumps and help make the jostling from the up and down motions less abrasive to your child. While suspension options are generally on more expensive models, they are well worth it – to you, your child, and the frame of your jogging stroller. While they may seem frivolous, items like cup holders for your child and the parent and a large storage area are very helpful. When on a run, you will both need something to drink and if your child needs a diaper change a mile away from home, you will appreciate that diaper bag. Also, look for a hand brake over a foot brake so you can help slow your roll when going downhill. Your child will also appreciate if their seat is comfortable and supportive on these runs when they get jostled around. Never, ever, overlook a five-point safety harness for your child. Any lesser safety harness or belt is just not acceptable when you are moving at high speeds over rough terrain. Always check your wheels before a run to ensure that they are secure and nothing is loose. Use your safety wrist strap every time you run because you never know when the jogging stroller will get away from you. While it is a voluntary program and not necessary, JPMA Certification if a giant plus on any product. Make sure that your jogging stroller is easy to maneuver and push over many types of terrain. It should be due to the pneumatic tires. The tires should grip better on rough terrain but be slower on surfaces such as pavement than tires that are slick. Use your handlebar brakes for your hands to slow down when going downhill but they may not be necessary when on flat ground. Air filled tires make going over rough terrain easier but they will require maintenance that foam filled or plastic tires will not. Those type of tires is found on regular everyday strollers. Look for canopies that cover most of your child from the elements such as wind, rain, and the sun’s rays. Canopies also make it easier to keep the sun out of your child’s eyes. There are some canopy fabrics that have sun protection built in to them. The best rating is UPF 50+ which means that the canopy fabric can block 99.9 percent of UVB and UVA light from your child. Even if your canopy does not have this rating, any canopy provides more coverage than no canopy at all. Consider whether you want a jogging stroller that has a locking swivel front wheel that you can use for everyday use and then lock the wheel when you run, or if you want a locked front wheel for the main purpose of just running. There is also the consideration if you want a model that will work with infant car seats. There are some joggers that will accept infant car seats and turn the jogger into a travel system. Just beware that some joggers only work with certain car seats while others use a universal kit to work with more infant car seats. This allows you to get more life and use out of your jogging stroller. Also, look for joggers that are easy to fold, transport, and fit in most vehicles. Washable fabrics is an added bonus. You can find jogging strollers from the inexpensive to out of this world go buy a Lexus expensive. And everywhere in between. It all depends on its features, who makes it, and how capable it is to do everything it is that it claims it can do. While you can go out and spend a house payment on a jogging stroller, usually you can find what you are looking for somewhere in the middle ground. Make a list of the features that mean the most to you and a budget. Then go shopping. You may also want to check out some of the best double jogging strollers. 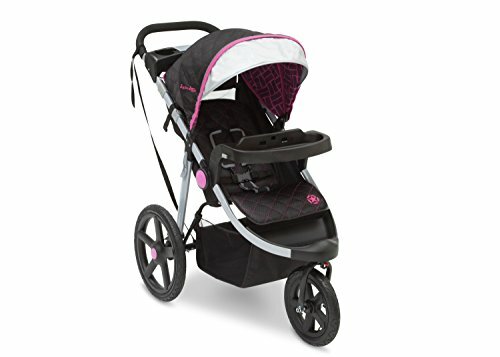 If you are looking for a jogger that will accept your Graco Click car seat, then this Graco Fastaction Fold Jogger Click Connect Stroller is what you are looking for. It has a one-hand fold that stands by its self and auto locks. This three wheel jogger has rubber tires that are air filled for suspension. There are even reflectors for added visibility in low lighting situations. To transition from walking to jogging, the front swivel wheel has a locking feature. There is a parent’s tray that has two cup holders and a place for your phone. There is also a storage basket that comes in handy. The child tray will hold snacks as well as a drink and can pivot out of the way or is fully removable. For comfort and safety of your child, the seat offers multiple reclining positions as well as a safety harness. The jogger can accommodate a child up to fifty pounds so it can grow with your child. The Graco works with all Graco Click Connect car seats. The stroller will accommodate children holds a fifty pounds, so it will grow with your child. This affordable jogger comes in four colors. This jogger is easy to fold and has the capability to stand up by itself. The jogger has trays for both the parent and child and has extra storage. The jogger does not roll straight so it is hard to run with. The front wheel of the jogger will randomly lock up. You can only use with Graco Click compatible car seats. 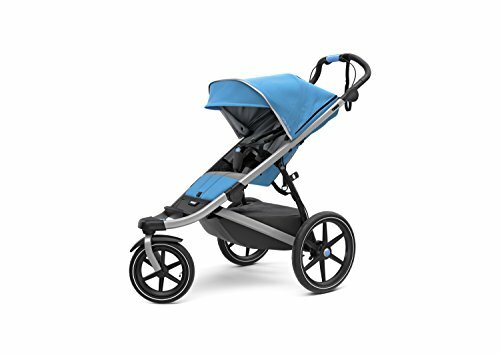 The Graco Fastaction Fold Jogger Click Connect Stroller is an affordable lightweight everyday stroller option that can be used as a jogger. It comes in four colors, is easy to fold and stands up, and has plenty of storage with trays for both the parent and the child. In addition, it has a seat that reclines and a harness that is convertible from three-point to five-point. The Graco will accommodate up to a fifty-pound child. However, the Graco jogger does not roll straight so it makes it hard to run with, the front wheel can lock randomly so when you are not jogging it can lock up as well, and this jogger is not compatible with other car seats. This jogger is not as sturdy for a serious jogger as some other jogger strollers out on the market might be. If you are just one that might just occasionally use it as a jogger and mostly use it as a stroller, it might be okay if you can get past the wheel locking up. If you are looking for a lightweight jogger, then you may want to consider the Joovy Zoom 360 Ultralight Jogging Stroller. While too heavy to be a lightweight stroller, it is one of the lightest joggers at only twenty-five pounds. For a comfortable ride, the Joovy has a seat that is extra wide and has multiple positions reclining seat. For a parent’s peace of mind, this jogger includes a running leash, a tire pump, and a parent’s organizer. The quick release rear tires are sixteen inches while the front tire that swivel but can be locked straight its twelve and a half inches. 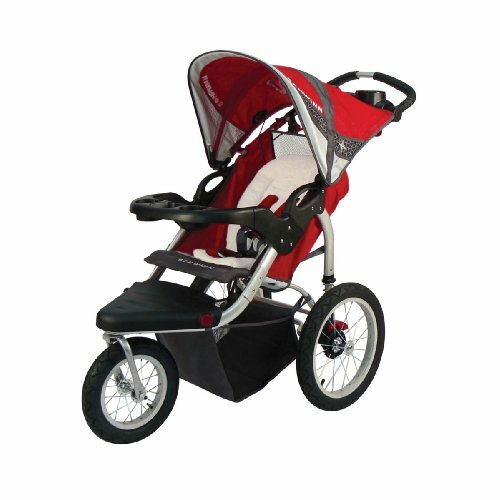 The jogger has an aluminum frame, rear straight axle and the entire stroller has an absorbing shock suspension. The jogger has a compact, easy fold. Your child will love that it has mesh pockets that can store things like toys and snacks. And the Joovy can accommodate a child up to seventy-five pounds. While the front wheel can lock for maneuverability of your wheelbase while running at greater speeds or even while walking. The rear wheels have linked one step parking brakes that ensure for greater stopping. The overhead canopy even has a peeking window so you can view your child without disturbing them or stopping. You can even purchase universal car seat adapters that will fit on the jogger so that an infant seat will fit on the jogger. The parent’s organizer has a place for two drinks and things like your phone and keys. There is even a zippered pocket for valuables. This model comes in four colors. It is a nice feature that it is easy to turn and push the Joovy. If you are looking for a lightweight jogger, the Joovy is one the lightest in its class. This seat is higher up for a more comfortable ride. The handlebars are very high and not adjustable. If you are shorter, then this is very uncomfortable. Taller children will hit their head on the overhead canopy. This stroller is very bulky for the average car trunk. The Joovy Zoom 360 Ultralight Jogging Stroller has some really good design qualities. The Joovy makes it easy to push and turn. The Joovy is easily one of the lightest jogging strollers in its class. The suspension on this jogger offers for a more comfortable ride for your child. The seat is up higher for a more comfortable ride. The fold on this jogger is easy and compact. The Joovy offer multiple positioning reclining seat that is extra wide that will accommodate child up to seventy-five pounds. However, the Joovy has a few issues. The handlebars are very high and not adjustable. If you are shorter, then this is very uncomfortable. Taller children will hit their head on the overhead canopy. This stroller is very bulky for the average car trunk. You need to consider all the pros and cons before you purchase this jogger. If you are looking for a great value on a jogger, then the Baby Trend Expedition Jogger Stroller may be just what you are looking for. The Baby Trend is a very affordable option and comes in five colors. The Baby Trend has bicycle tires that are large to roll over any surface with ease. The front wheel swivels to make maneuvering easy but will lock to make jogging easier. There is a parent’s tray with two cup holders and even a covered storage area. The child’s tray also has two cup holders. For your child’s safety and comfort, this jogger has a padded seat that reclines, a five-point safety harness, an overhead canopy, a tether, and ever a storage basket for storing all your child’s needs. This jogger can accept car seats with adapters. This jogger will accommodate up to a forty-two-inch car seat with a thirty-pound baby or a child from birth up to fifty pounds. The handlebar is rubber and is ergonomically shaped. The canopy will keep your child out of the elements and block them from the wind and sun. There are even reflectors on the footrest for visibility during low lighting situations. This jogger is JPMA Certified. If you are looking for a JPMA Certified jogger, the Baby Trend is for you. This option comes in five colors and is affordable. There are lots of creature comforts for your child including a five-point harness, a padded reclining seat, a tether, a canopy overhead, and a storage area for all their stuff. There are constant reports with the front wheel breaking. The reclining feature is a string contraption that allows forward motion when the jogger is in motion. If the braking system is not fully in alignment, the stroller will continue to roll even if the brake seems to be fully engaged. It is difficult to fit a bike pump over the valve of the front tire. The Baby Trend Expedition Jogger Stroller has many pros and cons. Let’s look at the pros first. This jogging stroller is JPMA Certified. The Baby Trend comes in five colors and it is a very affordable option if you do not want to spend a lot of money on a jogging stroller. The swiveling front wheel makes it easy to maneuver but you can lock it down to make jogging easy. However, there are quite a few cons. There are constant reports with the front wheel breaking. The reclining feature is a string contraption that allows forward motion when the jogger is in motion. If the braking system is not fully in alignment, the stroller will continue to roll even if the brake seems to be fully engaged. It is difficult to fit a bike pump over the valve of the front tire. I would just carefully consider all of the pros and cons before making a decision to purchase this jogger. Do you want a jogging stroller that is good for jogging, as an everyday stroller, and is lightweight so all you need is one stroller? 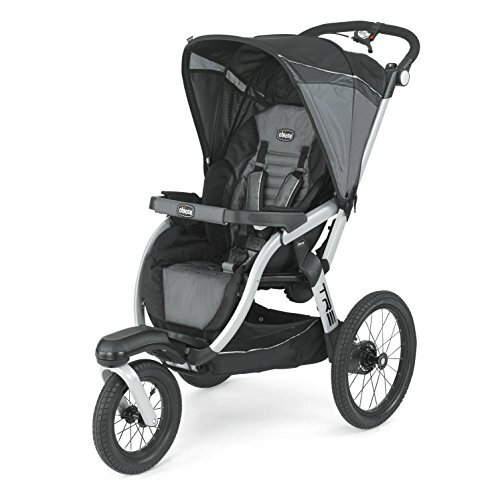 Then you need to take a look at the Thule Urban Glide 2.0 Jogging Stroller. This multifunctional stroller only weighs twenty-five pounds and is great as an everyday stroller and then can transform into an outstanding jogger. You can easily fold the Thule with one hand as the stroller has a compact fold that is easy to transport and store. The hand brake on the Thule is an integrated twist that makes it easy to brake and control speed on any terrain. There is a canopy with multiple position capability that has side vent windows so your child can get air. You can recline the seat with only one hand. Continue to keep your child safe with the adjustable five-point safety harness that is padded. This jogger has suspension so your child with have a comfortable ride. The front wheel swivels and then locks into place when you want to go jogging. The rear tires are sixteen inches. This jogger provides plenty of storage with a large storage area that is zipped up to protect it from the elements, a mesh pocket in the back, and two mesh storage pockets for toys or snacks. To top things off, this sleek and stylish jogger is available in four fashionable colors. The Thule has a compact fold that makes it super easy to transport and store. With an integrated twist, the hand brake on the Thule makes it easy to control the speed and the brake on any terrain. So your child can ride in comfort, this jogger has suspension that adds to the overall comfort. The Thule comes in four colors. It is difficult to lock and unlock the brakes. There are mainly only good things to say about the Thule Urban Glide 2.0 Jogging Stroller. With an easy one hand fold, you can easily control the hand fold that is compact and easy to transport and store. Four fashionable colors mean you can pick whatever color appeals most to you with this jogging stroller. The multiple positioning canopy can be positioning many ways and has side vent windows for cross ventilation. The seat can be reclined with only one hand. The storage area can stay dust free as it zips up, there is a mesh back storage pocket for more storage, and the inside has two mesh storage pocket for your child to enjoy. The only downside to this jogger is that the brake is hard to lock and unlock. In addition, this model does come with a hefty price tag, but if you take into consideration that it is the only stroller that you need, you may not think that this is a con. 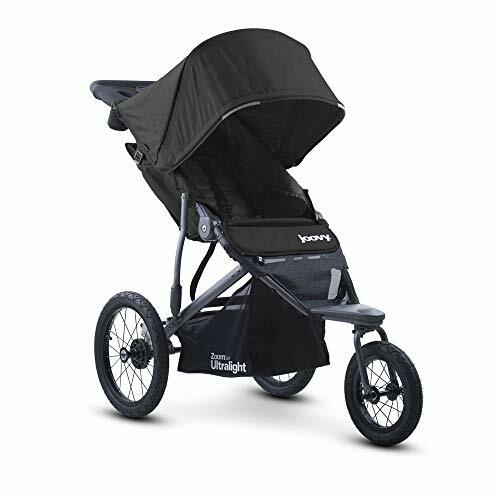 The Thule Urban Glide 2.0 Jogging Stroller is an amazing jogger and you couldn’t go wrong by purchasing this model. Need a jogger that is easy to run with? 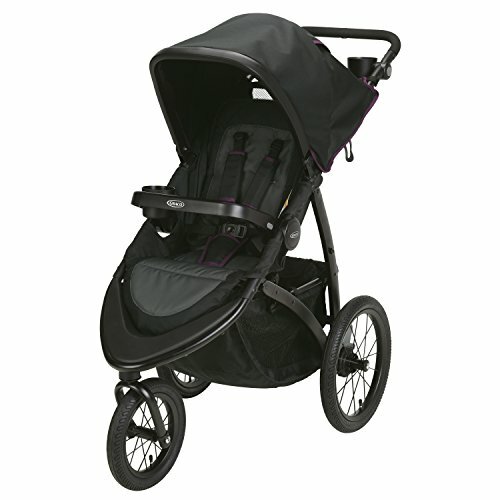 Then take a look at the BOB Revolution FLEX Jogging Stroller. This jogger has a locking swivel front wheel that can maneuver turns that are tight easily or it can lock in place to go over terrain that may be rough when you are jogging. Regardless of your height, find the perfect handlebar height with a handlebar that has nine different adjustable positions with a handlebar that is padded. The suspension system is adjustable as it has three inches of height travel and two different stages of support for weight which attributes to a smooth ride. For ease of storage and transport, the BOB has a two-step fold. You can even purchase a separate infant car seat adapter to add your car seat to this stroller. This jogger will accommodate children from eight weeks old up to seventy-five pounds. This jogger comes in six great colors. The BOB FLEX comes in six colors. The handlebar is adjustable to nine different positions so it is great for persons of any height. The suspension system allows for three inches of giving and two stages of weight support. This jogger is on the higher end of the price scale. When the BOB is folded, it will not self-stand. The jogger can be difficult to carry and lift. 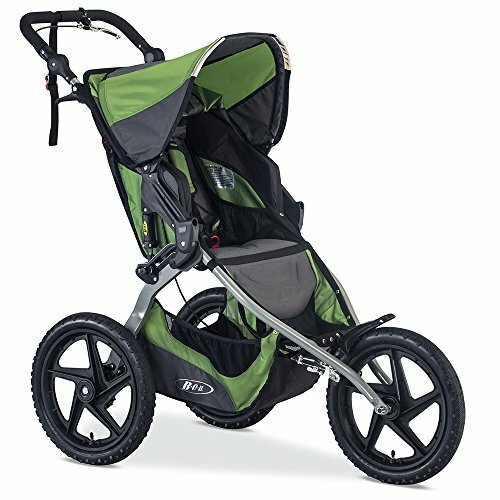 Overall, the BOB Revolution FLEX Jogging Stroller is a great jogger. The BOB FLEX is available in six fashionable colors. The handlebar is adjustable to nine different positions so you can find the right position for running; it is also great if you share the stroller. The suspension system allows for three inches of give and two stages of weight support. There is a two-step folding system that makes it easy for storage and transport. You can purchase additional adapters so you can use your infant can seat on this stroller for a true travel system. However, this jogger is on the higher end of the price scale. When the BOB is folded, it will not self-stand. The jogger can be difficult to carry and lift. While this is a good jogger, it is expensive and it does have a few flaws. There are some better models out there. You just need to weigh your pros and cons and choose the best model for your needs. If a lightweight jogger is a must, then you have to take a look at the Baby Jogger City Mini 3W Single Stroller. This jogger only weighs in at a little more than seventeen pounds. This compact jogger folds in one easy step. This three-wheeled jogger has eight-inch tires with front wheels that lock and suspension in the front wheel. This jogger even has a car seat adaptor. This jogger is available in eight colors. This stroller is lightweight for a jogger. This jogger comes in eight colors. The storage space is limited and hooks on the handles throw the balance of the jogger off. The Baby Jogger City Mini 3W Single Stroller has both good and bad points. On the good side, this stroller is very lightweight for a jogging stroller. This jogger has the advantage of turning and pushing easily. This compact jogger can be folded in one easy step. The canopy has two windows to peak in at your little one without disturbing them. This jogger comes in eight colors. However, the storage space is limited and hooks on the handles throw the balance of the jogger off. The back tires protrude so it is not easy to maneuver in a crowd. Overall, this is a pretty good choice for a jogger. It handles well, is lightweight, and the price is low to mid-range. Just weight your options before purchasing this jogger. If you want a jogger that some infant car seats can fit securely in, then you may want to consider the Chicco Activ3 Jogging Stroller. This jogger accepts all KeyFit30 and Chicco Key Fit infant car seats. The Chicco includes an armbar that is removable that will help accommodate an infant car seat. This jogger is user-friendly as it as a one-hand fold that stands, it folds flat for the trunk, and it has wheels that quick release to save space. In addition, you can control everything at your fingertips. The parking brake, fold release, and swivel lock is all on the adjustable handlebar. The canopy is weatherproof, extendable, and large. The multiple positioning seat offers extra comfort for your child. The FlexCore adjustable suspension makes it easy to transition from a strolling ride to a jogging ride. The front wheel swivels for ease of maneuvering or it can be locked. This jogger is suited for children from six months of age to fifty pounds. For safety, this jogger has a five-point safety harness. There is a storage basket as well as a parent’s tray for convenience. The tires are never flat and no maintenance so you never have to worry about pumping them up. The tires on the Chicco never go flat so you never have to worry about pumping them. On the adjustable handlebar are the fold release, the parking brake, and the swivel lock. The large canopy is extendable and weatherproof. The Chicco is very large and takes up a lot of trunk space. The Chicco is heavy and bulky to move. There is no cup holder in the front and the cup holder in the back is flimsy. The Chicco Activ3 Jogging Stroller seems to be a pretty good jogger. The tires never have to be pumped up, there is a five-point harness, the canopy is large, and the handlebar controls the fold release, the parking brake, and the swivel lock. There is also suspension that makes it easy to adjust from strolling to jogging easily. On the downside, the Chicco is very large and takes up a lot of trunk space. The Chicco is heavy and bulky to move. There is no cup holder in the front and the cup holder in the back is flimsy. Overall, this jogger has a lot of potential and seems to be worth the money at its mid-range price tag. If you are looking for an inexpensive jogging stroller with many features, then you may want to consider the J is for Jeep Brand Adventure All-Terrain Jogging Stroller. This jogger is inexpensive and offers many of the features that you look for in a jogger. 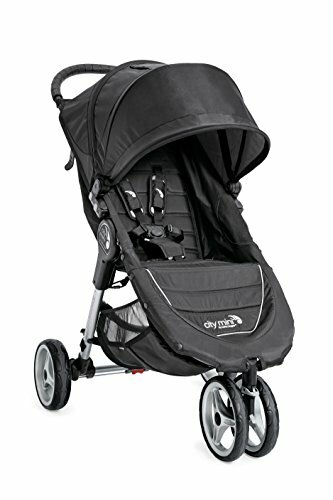 This jogger offers your child safety and comfort with a multiple positioning reclining seat that is padded, a five-point safety harness that has padded shoulders, a child’s tray, and a canopy that has a sun visor that is extendable to help keep the sun’s rays out. The J is for Jeep also keeps the parent in mind. This jogger has two cup holders and phone storage on a parent tray, a handlebar that is foam covered for comfort and has a tether strap for safety, storage area under the jogger, and to make loading and unloading your child easier – you can swing the child tray out of the way. This JPMA Certified jogger has a compact fold that is quick to lock and is easy to store and travel with. The swiveling front wheel makes turning easy and then you can lock it for jogging. This stroller will accommodate children up to fifty pounds and forty-two inches. The Jeep stroller comes in three colors. 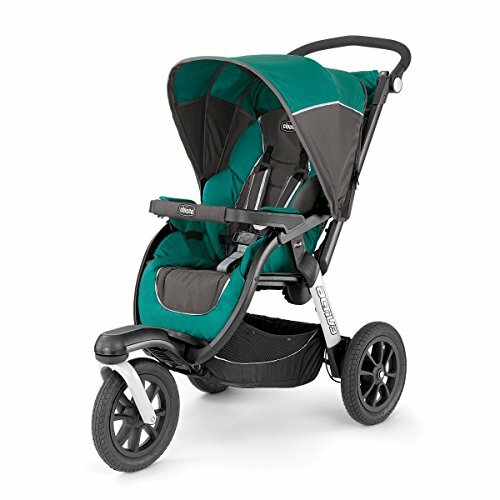 The Jeep jogging stroller is available in three colors. You can use some popular brands of infant car seats with this jogger to make it a travel system. The jogger is heavy and cumbersome. The Jeep jogger does not fold very small and it is easy to pinch your fingers in when closing and opening. Even though it says it fits brand X car seats, the adapters are hard to find. So if you buy the jogger because your car seat will fit, you still cannot use it. The jogger is too large for some trunks. The front wheel not only swivels, but it also wobbles uncomfortably. It shakes the stroller a lot. The canopy does not have a peeking window to look in on the child. As you can see, the J is for Jeep Brand Adventure All-Terrain Jogging Stroller has many more cons than pros. Let’s look at what it has going for it. If you are looking for a JPMA Certified jogger than the Jeep jogger is. The Jeep jogger is available in three fashionable colors. You can use some popular brands of infant car seats with this jogger to make it a travel system. This jogging stroller won’t break the bank. The Jeep has a swiveling front wheel that locks when you need it but it makes turning easy when it is not locked. Now, let’s look at some of the cons. The jogger is heavy and cumbersome. The Jeep jogger does not fold very small and it is easy to pinch your fingers in when closing and opening. Even though it says it fits brand X car seats, the adapters are hard to find. So if you buy the jogger because your car seat will fit, you still cannot use it. The jogger is too large for some trunks. The front wheel not only swivels, it wobbles uncomfortably. It shakes the stroller a lot. The canopy does not have a peeking window to look in on the child. The jogger clearly has some design issues that need to be worked out. However, you may decide at this price point to give it a try. Just beware of the issues. If you want more of a bicycle jogger, look to a bicycle name – the Schwinn Turismo Swivel Single Jogger. This jogger lets you use a car set adapter so you can use it with many brands of infant car seats. This aluminum framed jogger has a folding mechanism that is dual triggered for safety. The swiveling front wheels can manually be locked for serious jogging. The canopy has speakers that are mounted that can play most MP3 players. There is a molded child’s tray with two cup holds that flips open as well as a parent’s tray that is molded that has cup holders with finger grips. The tires on the Schwinn have a wide tread for great handling. The front tire is twelve inches while the rear wheels are sixteen inches. The suspension is exposed spring for a great ride. The handlebar is adjustable, rubberized, and slip resistant. There is a storage area under the seat. The jogger will accommodate children up to fifty pounds. This affordable jogger comes in three colors. The tires on the Schwinn have a wide tread for great handling. This affordable jogger comes in three fashionable colors. The canopy has speakers that are mounted that can play most MP3 players. The frame on the Schwinn flexes. The jogger has a potential pinch hazard when folding and unfolding. There is a significant wobble in the front wheel. While the Schwinn Turismo Swivel Single Jogger may not be for a serious jogger, it does have some good points. The tires on the Schwinn have a wide tread for great handling. This affordable jogger comes in three colors. The canopy has speakers that are mounted that can play most MP3 players. This aluminum framed jogger has a folding mechanism that is dual triggered for safety. The handlebar is adjustable, rubberized, and slip resistant. It does have some concerns that need to be addressed. The frame on the Schwinn flexes. The jogger has a potential pinch hazard when folding and unfolding. There is a significant wobble in the front wheel. While this stroller may not be great for serious joggers, it may work as a regular stroller or as a light walking stroller. With the Chicco Tre Stroller, you can remove the seat and use a KeyFit car seat during the first six months so you can have a jogger right away. After that, this jogger will accommodate a child in the seat from six months to fifty pounds. The canopy is extendable and full coverage. It has a mesh window so you can peek in at your child without disturbing them. All the fabric on the Chicco is water repellent and durable. The pneumatic tires are sixteen inches in the rear and a twelve-inch swivel in the front that can be locked. You can configure the fold of the jogger with just one hand. For normal storage, it has a self-standing fold. The Tre folds flat for your trunk. For small spaces, there is a compact fold. There is a FlexCore adjustable suspension that lets you pick between a strolling ride and a jogging ride. There are hand controls for braking and locking the swivel wheel. There is also a large storage area under the seat. You can configure the fold of the jogger with just one hand so that it can fold into three different configurations. The extendable canopy is full coverage. There are hand controls for braking and locking the swivel wheel. The jogger is pretty heavy and hard to move around. It is not easy to run in a straight line with. This is very expensive for what it offers. The Chicco Tre Stroller has some things going for it. You can configure how you fold jogger with just one hand into three different fold configurations. The full coverage canopy is extendable. There are hand controls for braking and locking the swivel wheel. The handlebars are adjustable for persons of different height and to make it easier to jog. 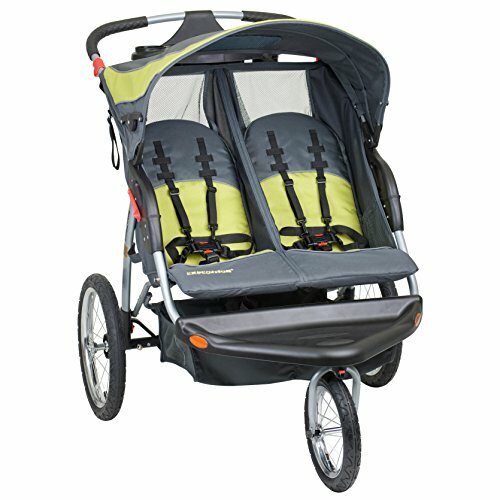 There is a FlexCore adjustable suspension that lets you pick between a strolling ride and a jogging ride. However, there are some concerning points. The jogger is pretty heavy and hard to move around. It is not easy to run in a straight line with. This is very expensive for what it offers. At this price point, you would think that most of the kinks would be worked out. There are many other models out there for the price that offer a more pleasant jogging experience. If you are looking for a double jogger, then you may want to seriously consider the Baby Trend Expedition Double Jogger. This jogger was created for two children who are 6 to 50 pounds each and not taller than 42 inches. The jogger has a locking front swivel wheel and there is a rear braking system that is activated by foot. The bicycle tires are rubber pneumatic and all-terrain – the tires measure in at 12 inches in front and 16 inches in the rear. 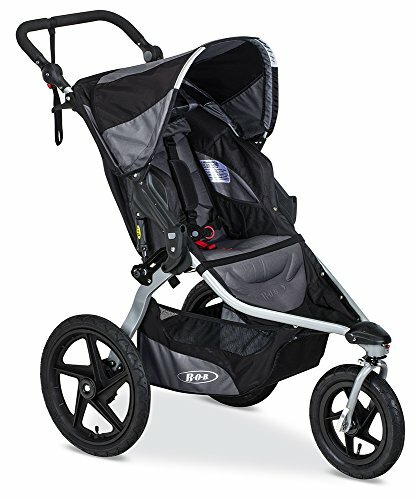 I wanted to like the Baby Trend Expedition Double Jogger. This jogger will fit up to two children up to fifty pounds each. The jogger has multiple positions reclining seating. For safety, there are five-point safety harnesses in each seat. There is a canopy for shade and to help protect the children from the elements. If you are looking for a jogging stroller for when trails are tough, then take a look at the BOB Sport Utility Jogging Stroller. The front wheel is fixed so it provides a more stable jogger for rough trails. All of the tires are knobby sixteen-inch polymer wheels. The front caliper brake is hand activated for more control when going downhill. The handlebar is padded and adjustable to nine positions for people of every height. The suspension system is adjustable as it has three inches of height travel and two different stages of support for weight which attributes to a smooth ride. The Bob Sport Utility has a quick folding system that is only a two-step for ease of storage and transport. There is a large storage area, and wheels in front and back that release quickly. With a push of a button, the seat reclines or sits upright. You can even add certain infant car seats to this model to make it a travel system. There is a large canopy to protect your child from the elements and the sun. The front wheel is fixed so it provides a more stable jogger for rough trails. The fixed wheel means it also runs straight. The seat sits upright or reclines with the push of a button. To protect your child from the sun, as well as the elements, there is a large canopy. The BOB has a longer footprint. The fixed wheel makes turns harder in a short amount of space. It is heavy and you have to lift the front wheel to make turns. 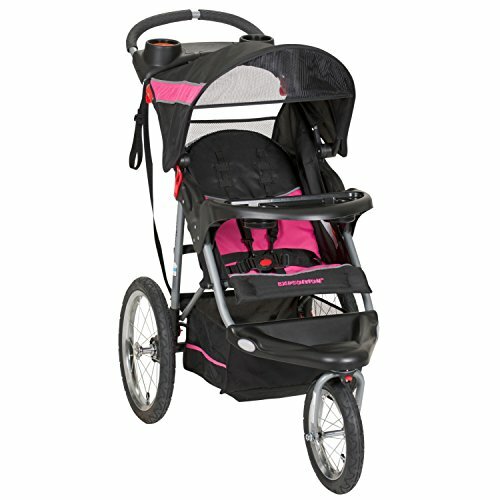 Overall, the BOB Sport Utility Jogging Stroller is a great jogging stroller. The fixed front wheel means that the BOB will run straight and is great for more rugged trails. The seat can recline easily – with just the push of a button. The padded handlebars can adjust for any height of runner with nine positions to choose from. And with just a few adjustments, you can add certain car seats to the BOB so an infant can enjoy a run as well. However, there are a few concerns with the function of the jogger. The BOB has a longer footprint. The fixed wheel makes turns harder in a short amount of space. It is heavy and you have to lift the front wheel to make turns. I still feel that the Bob is a good jogging stroller and once you got used to how to use it with the fixed wheel, it may be a jogger that you would enjoy taking for a spin. After deciding that a swivel wheel suits most needs better than a fixed wheel, I looked at the features. I carefully looked at all of them such as a locking front wheel, tether, brakes, five-point harness, canopy, reclining seat, and tires. Then I also looked at an adjustable handlebar, folding features, holders, and storage area. After I looked at all of that, the Thule Urban Glide 2.0 Jogging Stroller came out on top. This multifunctional stroller only weighs twenty-five pounds and is great as an everyday stroller and then can transform into an outstanding jogger. The Thule Urban Glide 2.0 Jogging Stroller has everything that you could want in a jogging stroller – and probably more.